but there’s more. (That’s kind of trippy though, right? About a month ago I saw a photo of a street in the states, with people driving on the right, and I second-guessed my lane choice for days. It’s weird.) For one thing, while stoplights may look the same as they do back in the States, not all traffic signs do. Hey, look! A stop sign! Not to be mistaken for a ‘yield’ sign. 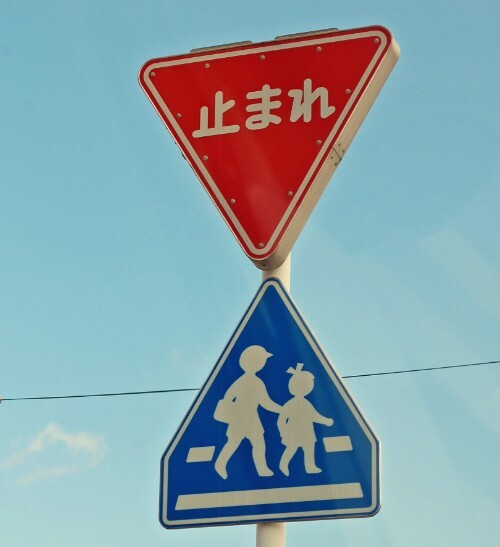 The blue sign under it is a school crossing. Quick, what do you think this sign is? If you guessed highway sign, you’re wrong. (If you guessed speed limit sign, then congratulations! You’re good at this game.) 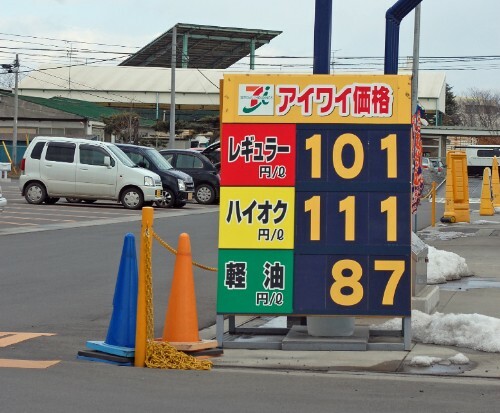 Let’s not forget, though, that Japan runs on the metric system, so that’s 40…kilometers…per hour. That works out to about 25 miles per hour. 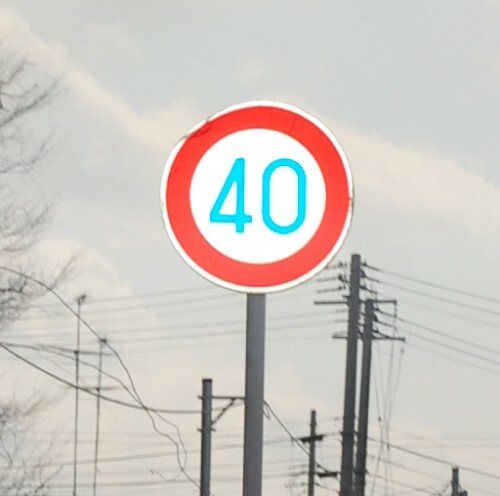 40 kph is a very, very common speed limit around here. You’re not going to see much above 50 (about 30 mph) unless you take the expressway, where you can pay the toll for the privilege of traveling 70 kph – or nearly 45 miles per hour. Yes. 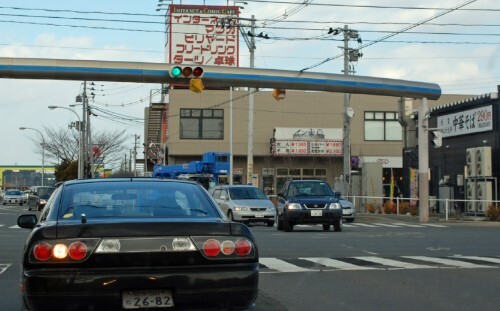 So, even though Japan is a small country geographically speaking, driving anywhere takes much longer than the distance would suggest because of the low speed limits. Hmmm, what next? Oh, yes: gas. Look! 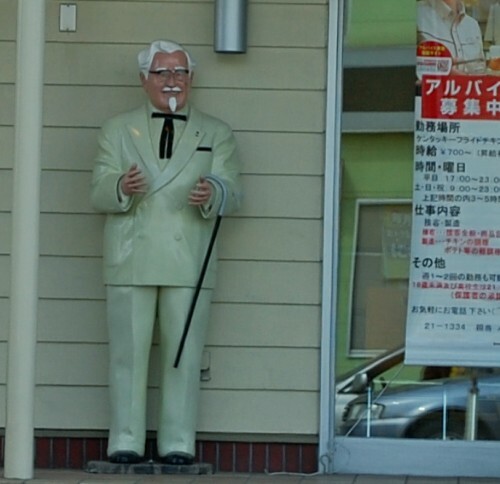 It’s a creepy Colonel Sanders! It’s both freaky and disturbing, in one convenient sculptural homage to the man who made arterial plaque a household name. Oh, my. Well, that’s all for now. Next time: police cars, driving laws, what qualifies as a ‘street,’ and more! Fun entry! 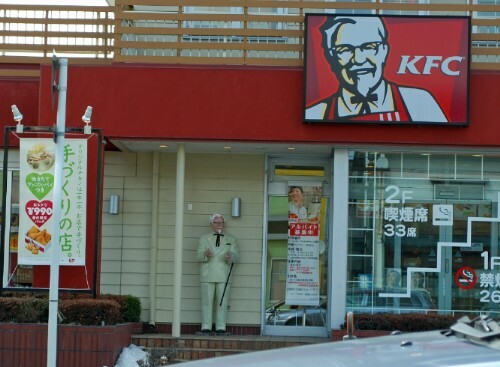 I especially like the creepy Colonel Sanders. I never did get a chance to visit his grave when I lived in Louisville. Although I passed the cemetery regularly. I knew most the signs, simply because I was in Germany a few months ago. However, the stop sign freaked me out! And the Colonel? My dog would be attacking him, he’s that odd. In England we obviously drive on the left, and all round red bordered signs are orders, so all speed limit signs are the same as in the photo above. We have mph like you, not km. I have driven abroad a few times on the right, which definately does take some getting used to! There seems to be suprisingly few accidents though when foreigners first drive abroad, I guess everyone is extra careful! Driving Lessons Bournemouth recently posted..Lighter evenings!